As part of my current US trip, I paid a visit to Portland, Maine, partly to check out the local coffee scene and partly because it made a cool addition to my overall journey. What I found was a thriving coffee scene which I’ll cover in the next few months, starting today with the lovely Bard Coffee. Bard Coffee occupies an amazing location next to Tommy’s Park, a lovely green space right in the heart of downtown Portland. For once got my timing right and arrived two weeks after Bard had reopened following a major refurbishment. Normally, it’s the other way around, with me arriving just before a refurbishment or, better still, in the middle of one! Bard roasts all its own coffee, with a good selection available at any time. On espresso, there’s the seasonal High Tide blend or the decaf Lo-Fi blend, while on bulk brew there are two coffees of the day, a light- and dark-roasted single-origin. Finally, you can have any of five single-origins, plus decaf, through the Kalita Wave filter, with one of the single-origins available through the Chemex. This last one is chosen to highlight the difference between the Chemex and Kalita brew methods. Bard Coffee occupies the corner of a lovely old building on Middle Street in downtown Portland, sharing an entrance with the adjacent clothing shop. This leads you through two sets of double doors into a small lobby. Ahead of you, a large window looks into one of Bard’s two seating areas, while the door to Bard is on your right (the clothing store’s to the left). After all this, you’ll be relieved to learn that you enter at the perfect spot, just in front of the Nuova Simonelli espresso machine at the end of the counter, which stretches away to your left. The positioning of the counter/entrance neatly splits Bard into two spaces. To your right, there’s a square seating area, facing onto Middle Street. A long, communal table occupies the centre, while a bar, with multiple power outlets, runs along both walls and the windows at the far end. The windows, which run the entire width of the store opposite the counter, stretch pretty much from floor to ceiling, making it a very bright space. The bulk of Bard lies to your left. A rectangular space, about twice as deep as the first seating area and slightly wider, it’s split equally between the counter and the remaining seating. Turning left as you enter, with your back to the first seating area, the counter runs away ahead of you, taking up almost all the right-hand side, with space beyond for some retail shelves. Opposite the counter, a long bench-seat runs the full length of the left-hand wall, a row of eight, large two-person tables in front of it. Although a larger space, the layout means that you can seat far more people in the first area than back here. Just like the first seating area, it’s a bright space. Four tall windows puncture the wall behind the counter, plus there’s a large window to the entrance lobby, which lets in plenty of light, all of which is supplemented by light from the front part of the store. For those (rare) gloomy Portland days, there are also plenty of electric lights. Bard’s already pretty spacious, but the high ceilings, which are even higher in the seating areas, give it an immense sense of space. The décor’s rounded off with a lovely wooden floor and subtle green-grey walls. The coffee’s every bit as good as the surroundings. I tried the house-blend (Costa Rica + Burundi) as a cortado, served in a small glass, with superbly-steamed milk. Described by the barista as bright and fruity, I doubt I’d have liked it much as an espresso, but in milk it was very well balanced. It was still pretty bright and fruity, but the milk had taken the edge off any excessive sharpness and it was a welcome change from the sweet cortados/flat whites I normally enjoy. 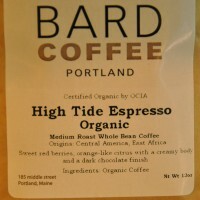 Bard mostly roasts single-origins, the house espresso and decaf being its only blends. In particular, Bard champions direct links with farmers, the Honduras Bertilio, for example, being unique to Bard. Although there’s two single-origins on bulk-brew, I recommend the brew-bar at the far end of the counter, with its own EK-43, three Kalita wave filters and a Chemex (for two). During my visit, the Colombia Las Margaritas was on both Chemex and Kalita, highlighting the difference between the two methods. You can see what my friend and fellow coffee-blogger, Bex of Double Skinny Macchiato made of Bard when she visited in the summer of 2017. This entry was posted in Cafe/Roaster, Cake, Coffee Shops, Evening Opening, Laptop Friendly, Portland (Maine), Retailers and tagged Bard, include, PortlandPortland2015 by Brian Williams. Bookmark the permalink.